Parliament today approved legislation to raise the airport service charge from departing foreign passengers to US$25 from July onward as part of the current administration’s revenue raising measures. The amendment bill submitted on behalf of the government by Progressive Party of Maldives MP Abdul Azeez Jamal Abubakur was passed with 32 votes in favour. The government anticipates over MVR100 million (US$6.4 million) in additional revenue from the increased departure tax. Parliament has also approved other revenue raising measures proposed by the government, including hiking import duties, reintroducing the bed tax until the end of November, raising the Tourism Goods and Services Tax (T-GST), and introducing GST for telecommunications services from May 1. A proposal by the administration of former President Mohamed Waheed to raise the service charge to US$30 was narrowly defeated in April 2013. The 1978 law imposing the airport service charge on departing passengers was first amended under the Maldivian Democratic Party government and raised to US$18.5 for foreigners. A raft of other bills were also passed at today’s sitting of the People’s Majlis, including a bill on the state wage policy that was vetoed by former President Waheed in December 2012. The legislation proposes the creation of a five-member National Pay Commission chaired by the finance minister with part-time members to determine salaries and allowances for the public sector and authorise pay rises. The bill stipulates that the commission must consider the cost of living, inflation and the consumer price index in determining wages. Moreover, salaries should incentivise government employees to work in islands with small populations. The commission would also formulate standards and rules for determining the state’s pay scale or appropriate salaries based on qualifications and nature of employment. Legislation on sole proprietors and business registration submitted by the administration of former President Nasheed in 2011 as part of an economic reform package was also passed today. According to the draft legislation on business registration, the bill seeks to ensure that businesses, partnerships and cooperative societies operating in the Maldives are properly registered; specify what kind of businesses must be registered along with procedures for registration; and oblige businesses to submit information to the Registrar of Businesses. The bill was also vetoed by President Waheed in April 2012 citing “socio-economic” concerns. Oil drilling and sea-based tourism “cannot coexist”, says Executive Director of local NGO Bluepeace Ali Rilwan, who has suggested that drilling for oil will create a number of problems. Rilwan’s comments follow further confirmation this week from President Abdulla Yameen that that the government will commence work on locating crude oil in the Maldives. According to local news outlet CNM, Yameen said that if the government is indeed successful in finding oil in the Maldives, the outlook for the entire country would change for the better. These statements were made at a land reclamation ceremony held on Sunday (March 16) on the island of Meedhoo in Dhaalu atoll. Speaking at the launch, President Yameen suggested that the Maldives could be developed using available resources. Famed for its luxury resorts, the Maldives has relied on tourism for an estimated 70 – 80% of its GDP. Plans to look for oil in the past had aimed to diversify the nation’s economy. There are currently no confirmed plans for the location of the drilling, should it take place – an uncertainty which has made it difficult for environmentalists to comment on the matter. Rilwan noted that the fact that it is not known whether drilling will be coastal or off-shore makes it difficult to predict environmental issues. The renewed interest in the search for oil was prompted by the results of seismic reports conducted in 1991– the recent findings of which have caused authorities to seek foreign assistance. The Maldives National Oil Company (MNOC) was founded in 2003 to take direct responsibility for the development of oil and gas industry in the Maldives. “The fact that two leading oil exploration companies in the world had invested in exploration drilling in the Maldives, keeps up the glimmer of hope for commercial success of oil and gas exploration in the Maldives,” the MNOC has said previously. Managing director of the MNOC Ahmed Muneez told local media last month that the government intended to start work on new exploration within a few months. “We have contacted a Norwegian company and a German company to help us better understand the findings of the study. Based on this report, we’re hopeful of advertising the Maldives as a new destination of oil exploration,” Haveeru quoted Muneez as saying. He explained that an outside company would be hired to conduct a global advertising campaign in order to market the country as an oil source. Under the presidency of Mohamed Nasheed, the Maldives – famously vulnerable to the effects of climate change – had pledged to become carbon neutral by 2020. Nasheed stated that the Maldives was a key model for other countries seeking to become more sustainable, and that an inability to meet the unilateral commitments would prove detrimental to wider arguments around the globe for adopting law carbon initiatives. The government of Nasheed’s successor Dr Mohamed Waheed also said that it was committed to “not completely” reversing the Nasheed administration’s zero carbon strategy: “What we are aiming to do is to elaborate more on individual sustainable issues and subject them to national debate,” said Waheed. Speaking to Minivan in October 2012, the government assured that they were adhering to their commitment to become carbon neutral by 2020 in spite of political uncertainty. “We are continuing with the carbon neutrality program,” she said. “We are giving it our best shot,” said then Environment Minister Dr Mariyam Shakeela. Minivan News was unable to obtain comments from the Ministry of Environment and Energy at the time of press. Mohamed Waheed Hassan Manik has fled the Maldives with MVR500,000 (US$34,000) in cash and no dignity. Last night, at around 10:30 pm while opposing candidates and their supporters were busy holding their last campaign rallies ahead of tomorrow’s vote, Waheed hastily got into a speedboat waiting at the jetty straight in front of his Office and beat a retreat. He sounded bitter, and was determined, even at the last minute, to attack his former President. Waheed spent the night of the worst crisis in recent Maldivian history hiding inside the official residence while his wife Ilham dolled herself up for the presidential oath taking ceremony planned for later in the day. “I will have to consider what the atmosphere is like in Maldives,” he told Haveeru yesterday when asked if he plans to return. 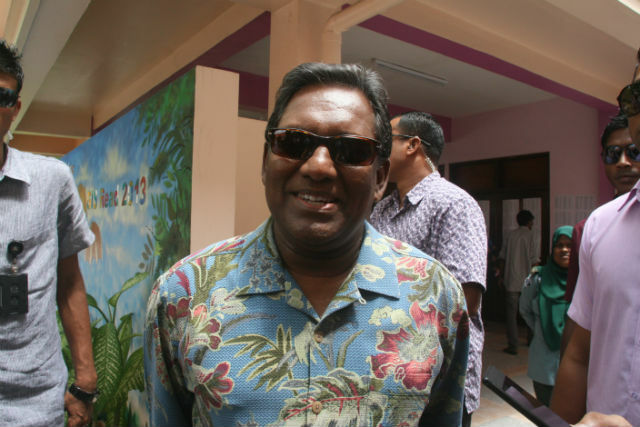 Waheed has a reputation for fleeing – when things got tough back in the 1990s when he was an MP, he ran off abroad for a job in the United Nations. He has boasted that he provided education for millions of women in Afghanistan when he was posted there after the American invasion. In the lead up to these presidential elections, he was asked on TVM’s RiyaaC programme if he would stay or flee should he lose: “I will stay,” he lied. The European Union has said it is prepared to consider “appropriate measures” should Saturday’s run-off election be subverted, and the country fall into authoritarianism. “The EU underlines that neither continuing uncertainty nor a drift towards autocratic rule would be acceptable to the EU and that it is therefore ready to consider appropriate measures should the poll on 16 November not bring the electoral process to a successful conclusion,” declared EU High Representative Catherine Ashton. “The EU notes that, on 9 November, Maldivians voted in high numbers in the repeated first round of Presidential elections, reflecting their desire to exercise their democratic rights and their trust in the Elections Commission. As in September, the first round was conducted in a professional and impartial way,” Ashton stated. “The EU notes that a second round is now scheduled for Saturday 16 November, but in circumstances not foreseen in the Constitution. The EU considers that any attempt to further delay or otherwise influence the outcome of the elections could only be intended to prevent the people of the Maldives from exercising their democratic right to choose their next president,” she declared. The statement did not outline what such “appropriate measures” might entail. The EU last week was reported to have declined to extend the duty-free status of imported fish from the Maldives, following the country’s failure to comply with international conventions concerning freedom of religion and treatment on women. However Minivan News understands that the timing was coincidental. “It is true that the Maldives applied to be granted the status of beneficiary of the EU preferential trade arrangements for sustainable development and good governance (GSP+). However, the application is still under review by the EU with a decision to be expected by the end of 2013. It is premature to anticipate on whether the Maldives will receive the GSP+ status or not,” EU trade spokesman John Clancy told Minivan News. The Asian Centre for Human Rights (ACHR) has meanwhile recommended the international community impose travel and other restrictions against President Mohamed Waheed, Police Commissioner Abdulla Riyaz and Supreme Court Justices Ahmed Abdulla Didi, Abdulla Saeed, Adam Mohamed Abdulla and Ali Hameed Mohamed. “The time has come to ensure that all those who subvert democracy and the rule of law are held accountable by denying visas as well as any association including employment opportunities by the United Nations and other inter‐governmental organisations,” stated the regional NGO, which has special consultative status with the UN’s Economic and Social Council (ECOSOC). The Commonwealth Ministerial Action Group (CMAG), the international body’s human rights and democracy arm, has meanwhile placed the Maldives on its agenda. President Mohamed Waheed, who departs tonight on an official trip after drawing MVR 525,000 (US$34,000) from the state treasury two days before the election, said he was “unconcerned”. “Let CMAG decide whatever they will,” Waheed said. The EU has long been the Maldives’ most lucrative tourism market in terms of bed nights and expenditure. Arrivals from China have eclipsed those of any one European country, however countries such as the UK, France, Germany and Italy remain core markets due to longer average stays and higher expenditure than many Chinese guests. The US government has said it is deeply concerned by President Mohamed Waheed’s “unprecedented decision” to remain in power past the mandate of his presidency, which expired on November 10. “This action has endangered the Maldivian people’s right to elect a leader of their choice,” stated the US Embassy in Colombo. “The democratic process must be supported by quickly concluding a free, fair, transparent and inclusive runoff election that results in the prompt inauguration of the new president. In the lead up to the November 16 second round vote, it is important to avoid violence and for the police and military to show restraint and respect the human rights of all Maldivian citizens,” the US Embassy stated. Cabinet ministers revealed yesterday that Waheed had arrived at the President’s Office late on Sunday evening prepared to resign and hand over power to the Speaker of Parliament, as stipulated by Article 124 of the constitution, but claimed to have convinced him otherwise. His Vice President, Waheed Deen, had resigned that morning. Minivan News understands that defence chiefs arrived at the President’s Office prior to Waheed’s address to the nation, initially scheduled for 10:30pm on Sunday. The address was delayed an hour, before Waheed appeared and said he would resign on November 16, the date scheduled for the delayed run-off vote. “Many Maldivians, international organisations and countries are pressuring me to resign and temporarily hand over the government to the People’s Majlis Speaker. On the other hand, even more citizens want me to stay on, to continue with administration of the country, to carry out my duty,” Waheed claimed. After making the statement, Waheed and his wife were escorted off Male to the presidential retreat of Aarah, as violent protests erupted in the capital. “The term of the current government has now expired without a newly elected government to replace it. This is the case despite two free and fair elections over the last two months,” Baird remarked. The Maldives returned to the polls today, after weeks of delay and brinkmanship following the Supreme Court’s annulment of the initial first round held on September 7. Today’s vote sees the Maldivian Democratic Party’s former President Mohamed Nasheed facing off against the Progressive Party of Maldives’ Abdulla Yameen, and the Jumhooree Party’s Gasim Ibrahim. Nasheed had been set to face the Yameen (25.35 percent), half brother of former President Maumoon Abdul Gayoom in a run-off on September 28. However the vote was suspended by the Supreme Court after third-placed candidate, resort tycoon Gasim (24.07 percent), filed a case alleging vote rigging – despite unanimous positive assessments by more than 1000 local and international election observers. Current President Dr Mohamed Waheed, whose name appeared on the ballot on September 7, has subsequently withdrawn his candidacy after receiving just five percent of the popular vote in the initial polling. After the court had ordered the first round to be repeated on October 19, the vote was again delayed after both Gasim and Yameen refused to place their signatures – a provision mandated in the Supreme Court ruling – on the revised electoral register. With the term of the current president due to end on Monday (November 11), a second round run-off – if no candidate receives more than 50 percent of the vote – will take place tomorrow. Total votes cast were 208,504 of which 2331 were deemed void, leaving a total of 206,173 valid votes out of 239,105 eligible voters. For democracy in Maldives to move forward, it is essential to build upon the successful November 9th election and immediately proceed with the required and previously agreed upon second round. U.S. and international observers viewed the peaceful and active voter participation as a clear indication of the Maldivians’ desire for a democratic transition. The positive result of November 9 yet again demonstrates the consistency and capacity of the Elections Commission to deliver a quality electoral process. It is now imperative that the second round take place immediately and in line with Elections Commission directions in order to ensure the Maldivian people are led by an elected president of their choice. To delay second round voting beyond the constitutional requirements for a new government by November 11 will create uncertainties that may destabilize Maldives. It is unreasonable and unacceptable for parties to continue to demand changes to an agreed election date. Voters deserve a greater degree of predictability over something as serious as a presidential election. Changing the goalposts is unfair to Maldivian voters; we believe Maldivians deserve better. 2:55am – During a press conference, the Elections Commission said it was working towards holding the second round on November 10 as scheduled, but said a lack of cooperation from one candidate was holding up preparations. “We are working to hold the second round tomorrow but the times may have to be changed. We want to hold it tomorrow as it was agreed by the three candidates and the president and all the concerned authorities,” said EC President Fuwad Thowfeek. The PPM had agreed to sign the lists [for the run-off] but had not been heard of since, the EC said. “We kept saying that November 16 would have been better for the run off, but the president and the candidates asked for the 10th. We agreed on the 10th at a meeting with the president and party representatives,” said Thowfeek. Ballot papers had already been printed and sent abroad, while the lists had also been sent overseas with the exception of two polling stations. Lists could be sent up until midday, the EC said. The EC noted that a case was still going on at the Supreme Court. Asked about the financial losses as a result of a delay, the EC said officials sent abroad would have to return and new lists would have to be prepared. The estimated cost of the delay would be MVR 25 million (US$1.6 million), the EC estimated. This equates to an 86 percent voter turnout – two percent less than the annulled September 7 poll – suggesting that early fears on Saturday about low voter turnout were misplaced and many people instead queued throughout the day rather than lining up to vote early. The results correlate strongly with those of the annulled September 7 poll, which saw Nasheed receive 45.45 percent of the vote, Yameen 25.35 percent, Gasim 24.07 percent and incumbent President Mohamed Waheed 5.13 percent of the vote. Waheed later withdrew from the polls, and his coalition partner the Dhivehi Rayithunge Party (DRP) defected to Nasheed’s MDP. However it seems that the vast majority of Waheed’s votes transferred to the Yameen’s PPM, taking him up to almost 30 percent in Saturday’s poll. Minivan News observed that no two local media outlets who did their own counting appeared to have the same figures, or figures matching the EC’s results exactly. 1:30am – The Elections Commission press conference is due to begin shortly. “In my view if the international community says that they will not recognise Waheed after November 11 then we will have elections. Then again it’s very difficult to see the international community doing the right thing. We are in this mess because they recognised a rebel government in February 2012,” he said. The Commonwealth Secretary-General’s Special Envoy, Sir Donald McKinnon, noted this evening that he was pleased that the 9 November Maldives presidential election was able to take place today in a calm and peaceful manner. “All initial reports suggest that this was a good election, and I look forward to hearing the more definitive reports of domestic and international observers shortly. The Elections Commission should be commended for its consistency in delivering another well-managed and credible election. “I commend all stakeholders for ensuring that the Maldivian people were able to have their say at the ballot box today in a seemingly free and fair manner. “It is important now that the electoral process move forward swiftly to its conclusion, with the holding of the second round. “It is unreasonable and unacceptable for parties to continue to demand changes to an agreed election date. Voters deserve better from their leaders and a greater degree of predictability over something as serious as a presidential election. “Any further delays would create uncertainty for the voters, place extra demands on the Elections Commission and lower people’s confidence in the country’s democratic institutions. 10:45pm – Yameen has held a press conference and indicated that he would not sign the voter registry for the run-off polls. Yameen said, “No, election is not going to happen tomorrow. Simple reason being that the Elections Commission is not prepared for that. Elections Commission does not have a list that has been pre-signed by the candidates. What they have is a fresh list. So a fresh list for us to review and sign, for verification we need at least 48 hours. So the list they have we are not sure whether that is the list they had for today’s voting. The PPM candidate claimed Gasim had expressed his support, along with his coalition partner the Adhaalath Party. “Tomorrow we will sit down with Gasim. He has expressed support to us. Also the adhaalath party has expressed support, [Yameen’s running mate] Dr Jameel has been in contact with them. 10:21pm – Transparency Maldives will give its assessment of the election at 11pm tonight at a press conference, while the EC is also expected to announce the provisional results. 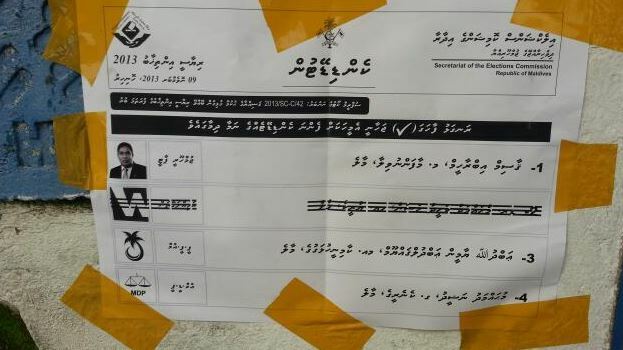 8:51pm – The Maldivian Democratic Party (MDP) has said that the second round of the Presidential elections must be held, as scheduled, tomorrow, Sunday 10 November. The MDP calls on the international community to do all they can to hold the second round of elections tomorrow to ensure an elected President is sworn in by the constitutional deadline. “The international community must apply pressure – including targeted, punitive sanctions – on those individuals who seek to undermine Maldivian democracy. 8:02pm – Jumhooree Coalition Presidential Candidate Gasim Ibrahim’s spokesperson Ibrahim Khaleel has accused the Elections Commission (EC) of anti-campaigning against their candidate. Khaleel is quoted in local media as stating that the EC has today infringed upon the electoral rights of candidates. Khaleel stated that the EC, in a press conference held Saturday afternoon, had spoken about JP refusing to sign the voters’ list which is to be used in a second round of elections which, if necessary, are to be held on Sunday. He then alleged that this statement by the EC would lead Gasim to lose support. EC President Fuwad Thowfeek cited words of JP’s Deputy Leader Ibrahim Didi, who, according to Thowfeek had told him the party “had no objections with proceeding with elections, but [we] refuse to sign the voter lists”, and also had stated he would send in a letter saying the same. Khaleel, however, denied that this way the party’s stand and claimed instead that it was the Deputy Leader’s personal opinion. EC Member Ali Mohamed Manik had been asked a similar question at today’s press conference by Gasim-owned VMedia, whether the commission’s intention was to anti-campaign by talking about the matter. 7:33pm – Unofficial results from Haveeru, Raajje TV and MvDemocracy show Mohamed Nasheed leading with roughly 46 percent of the vote. Yameen Abdul Gayoom comes second with approximately 30 percent and Gasim Ibrahim is third with approximately 23 percent of the vote. Unofficial voter turn out was lower than the annulled September 7 elections with all candidates gaining fewer votes today than they did on September 7. Although Nasheed seems to have gained a percentage point more than he did in the annulled first, he seems to have gained less gross votes than he did in the annulled round. Yameen seems to have maintained a similar number of gross votes, while Gasim Ibrahim seems to have lost the most gross votes. It appears Nasheed suffered the most due to the lower turn out. Yameen may have maintained his votes if his September 7 voters turned out to vote today, or if he gained votes from those who had previously voted for Gasim or Waheed. Otherwise, the results so far seem to thoroughly vindicated the credibility of the first round on September 7. 7:00pm – Irufushi resort, a resort whose management were alleged to have engaged in a campaign against MDP supporting staff following the results of the September 7 poll, has still seen 48.5 percent of votes received cast in favour of Nasheed according to EC figures. Irufushi is owned by Ahmed ‘Sun Travel’ Shiyam, the leader of the Maldivian Development Alliance which is allied with the Progressive Party of Maldives (PPM). PPM candidate Yameen has received 45 percent. Meanwhile, the ballot box on Sun Island – reported as a resort where the wearing MDP party colours led to a wave of dismissals – has seen a landslide of votes for its owner Gasim Ibrahim, who has received 88 percent of votes cast according to the EC statistics. 6:29pm – According to results from MVDemocracy, Nasheed is leading with 46.58 percent (70,099 votes) while Yameen is placed in second with 29.98 percent (45,117 votes) and Gasim 23.43 percent (25,261 votes). According to the website, 380 ballot boxes have been counted while 95 remain uncounted. A total 150,477 votes have so far been counted. 6:26pm – Haveeru’s figures also appear to show Nasheed having taken the first of the overseas boxes. 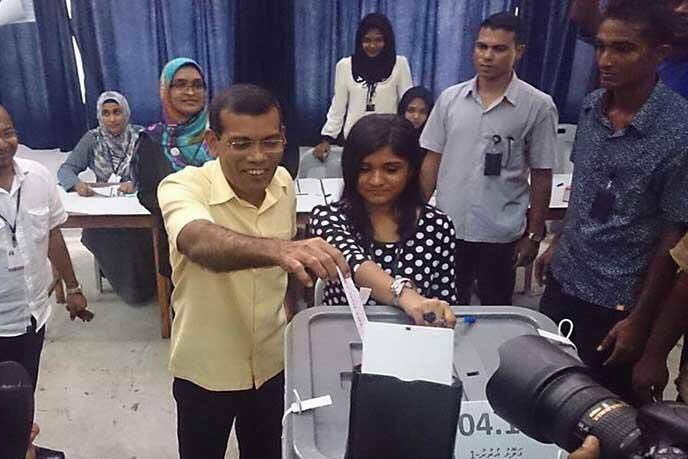 With 160 of 184 eligible votes counted in Singapore, Nasheed has received 98 of the ballots cast. 6:22pm – With 61 percent of registered voters having had their votes counted in Haa Alif Atoll, according to Haveeru, Nasheed leads in the country’s northernmost atoll. Haveeru’s counting reports 45.88 percent votes cast for Nasheed, 32.65 percent for Yameen, and 21.47 percent for Gasim. Haveeru notes that Nasheed gained the highest percentage in the atoll in the annulled round also, taking 44.48 percent on that occasion. 6:18pm – The Jumhooree Party’s Youth Wing Leader Moosa Anwar has submitted a letter to the Supreme Court, requesting that the second round of elections scheduled for Sunday be annulled. Anwar said in his letter that if the second round of the Presidential election is scheduled for the next day itself, candidates are “being stripped of some electoral rights”, according to local media. Among the “electoral rights” that he claimed may be lost, he pointed out that since there is a such a short window of time, candidates may not be able to campaign for the second round. He further said that this may make it difficult for “whichever candidate who finishes third place to endorse the runner-up who makes it into the second round”. Anwar also alleged that “many people have been deprived of their right to vote in the second round as the Elections Commission gave only a duration of three hours in which to re-register for it. Earlier today, the Supreme Court has ruled that their verdict on annulling the September 7 election remains in effect, and hence the current President and his government will remain in power if a new government is not elected by November 11. 5:55pm – The official results on the Elections Commission’s website, representing 27.7 percent of eligible voters, so far place Nasheed in the lead with 42.1 percent of 65539 valid votes cast. Yameen follows with 33.89 percent, and Gasim trails behind with 24.11 percent of valid votes cast. “Voting is important for the country and I think Anni will win in the first round,” said 23 year-old Abdulla Rasheed. “I didn’t think today’s vote was going to happen. The Supreme Court will probably annul this round also if Anni wins first place,” said 28 year-old Nasheed. “I’m excited to vote today, but not as much as on September 7 because of all the difficulties that have happened since then [with the obstructed September 28 and October 19],” said 25 year-old Mariyam. 5:02pm – The Supreme Court has ruled that their verdict annulling the September 7 elections remains in effect, and declared that the current President Mohamed Waheed and his government will remain in power if a new government is not elected by November 11. The verdict – signed by four of the seven judges sitting on the Supreme Court bench – contradicts the parliamentary motion to appoint Speaker Abdulla Shahid as an interim President in the event that a new elected President cannot be sworn in by November 11. According to local media, the order was signed by Judge Ali Hameed, Judge Ahmed Abdulla Didi, Abdulla Saeed and Abdulla Areef – the same four who annulled the September 7 polls based on a secret police report discredited by an expert UN review. The verdict was issued in a case submitted by Progressive Party of Maldives (PPM) lawyer Mohamed Waheed Ibrahim, seeking the court to declare illegal parliament’s motion to appoint the Speaker as the interim president. “The MDP is pleased to note that today’s polls proceeded smoothly, without major incident. The elections were observed by over 2,000 party officials as well as local and international election monitors. The isolated complaints received by the MDP mainly related to the voter registry and predominantly involved issues such as spelling errors in the voters list compiled in accordance to the Supreme Court guideline. In most cases, Election Commission staff promptly resolved the issues and people were able to cast their vote,” the party stated. 3:30pm – Polls have officially closed, but those still waiting in line will be able to cast their ballots. 3:15pm – Transparency Maldives (TM) has issued a press release thanking its 400 plus observers and reporting no major incidents up to this point. TM reported that 99 percent of polling stations were open by 8am, and two or more candidate/party observers were present at 94.6 percent of all polling stations. 2:45pm – Maldives National Defence Force (MNDF) officers have circulated an appeal calling on their fellow soldiers not to obey “unlawful” orders issued by President Waheed or his political appointees, following the expiry of his presidential term at midnight on November 10. 2:10pm – “We have no interest whatsoever in electing any particular candidate. I don’t believe that we have infringed any candidate’s rights by truthfully and factually answering media queries about who has so far signed and not signed the register,” said Thowfeek. “We have a window of less than 24 hrs between the two rounds of voting, and so must speak of the matter. If this is then interpreted as anti campaigning, then the only choice left would be to stop providing information to the media completely, and that probably isn’t an acceptable option,” he concluded. 2:00pm – Initially, neither the PPM nor the JP turned up to sign the lists, and the JP has still not arrived to do so, revealed the EC. JP Chairman Dr Ibrahim Didi told Minivan News earlier today that his party had no objection to holding the elections, but that it would not sign the lists. He said that the party would send a letter informing the EC of such, though the EC has not yet received any correspondence. After signing some lists earlier today, the PPM left for a break before sending a letter stating that they would only sign lists with changes. “It looks as if they are not so keen on fulfilling their duties and responsibilities. Signing these lists is a duty given to candidates & their reps by the SC,” said Thowfeek. Thowfeek went on to say that the biggest number of complaints received had been regarding campaigning after the 6pm cut-off yesterday. “The biggest complaint regarding campaigning/anti campaigning after 6 yesterday was about a sermon being shown on about 4 channels,” he added. 1:55pm – When asked about the reported complaints from the PPM regarding the potential use of lists different to those signed by the parties, Elections Commission member Ali Mohamed Manik said no such complaints had been received. 1:45pm – “We are ready and so are the police and MNDF,” continued Thowfeek. 1:40pm – “As per SC regulations all candidates need to sign voter registry. We are very fortunate that all candidates have signed lists for the first round being held today,” said Thowfeek. He went on to say that the JP had not signed any of the lists for tomorrow’s poll, whilst the PPM had signed some. The MDP, meanwhile, has said it is happy to sign the lists. 1:30pm – After casting his vote earlier today, President Waheed told Minivan News that he felt he had left a good democratic legacy, and hoped the transfer of power would be a smooth one. 1:10pm – A twitter hashtag #dearmaldives has been collecting messages of support for the election from around the world, with dozens of people from countries ranging from Cyprus to the Congo wishing good luck to the democratic process. 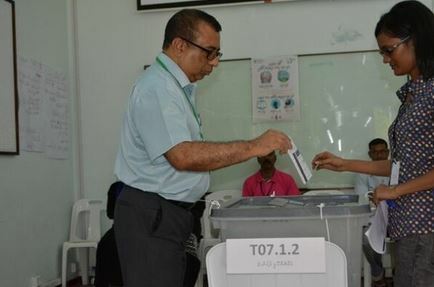 11:55am – Elections Commissioner Fuwad Thowfeek casts his vote. 11:45am – Faphun, 29, queuing to vote with her younger sister Shafega, 10, said she was hoping for the best after previous delays. Numbers in lines are growing steadily after a low early turnout. Meanwhile, Shafega said that she was very excited and wished she could vote today. 11:25am – The MDP complaints team said they have received complaints of some voters unable to vote because of minor spelling differences between ID card and voter registry. Most voters have been able to resolve issues and vote after calling the EC complaints bureau, MDP’s Nooshin Waheed said. 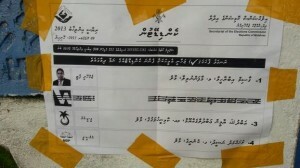 MDP is now filing one complaint regarding a man who was unable to vote because of minor difference in address. 11:11am – A group of people went up to the fifth floor of Elections Commission and created disruptions. Police advised them and sent them away. 11:00am – Police have taken the required ballot papers to Dhaal Atoll Bandidhoo Island. The ballot papers sent there originally were less than required. 10:55am – MDP candidate Nasheed expresses his confidence after voting at CHSE. 10:40am – Maldives High Commissioner to Singapore, Mauroof Khaleel confirmed to Minivan News that former president Maumoon Abdul Gayoom is in Singapore at the moment. Gayoom is registered to vote in Male’ according to the Elections Commission 1414 service. 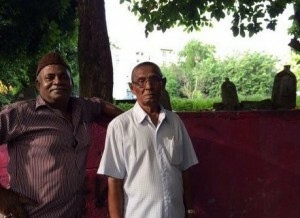 Khaleel said he does not know if Gayoom intends to go to Male today. 10:20am – PPM candidate Yameen doubts the MDP can achieve a first round victory. Aske if he would accept election results whilst having issues with the voter registry, he called for these polling booths to be closed immediately. 10:15am – More twitter users saying officials obstructing people wearing yellow from voting. No campaigning is allowed on polling day. Voters can wear any colour, so long as it does not have campaign messages. 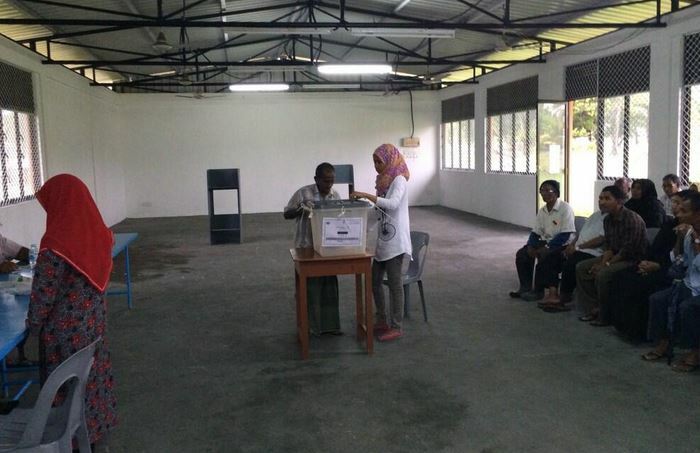 10:10am – Fathimath Irene, 28, voting at Aminya School – T08 1.2 – said that after waiting in line for an hour, she was told by EC officials she could not enter the polling station because she was wearing a yellow shirt. She was told to leave, but pointed to other voters wearing pink and red. People at the polling station told her not to leave, should be able to vote no matter which color. After officials called someone, Irene was finally allowed to vote. 10:00am – According to police, voting at Majeedhiyya School ST 2 box was suspended for a bit because someone who was assisting an old person voted instead of them, but voting has resumed now. Ahmed Ali, a 35 year-old voter standing behind Didi, retorted, “You just don’t appreciate even the sincerest efforts by the Elections Commission, do you? With a free vote, insha Allah we will take back our country in a single round. 9:50am – “I think this time voting will go smoothly. I just hope the Supreme Court doesn’t interfere again tonight,” said 63 year old Ameena Ali, who voted at the Centre for Higher Secondary Education in Male. “Poor [Elections Commissioner] Fuwad Thowfeek was hospitalised due to this pressure. It is mainly his perservenece that has brought us here. It is now up to us to win back democracy in one round,” said 65 year-old Fathimath Shaheedha. 9:40am – Social media continues to circulate pictures of people guarding cemeteries, in reference to the police intelligence report – recently discredited by UN experts – alleging deceased voters had taken part in the September 7 poll. The report was the primary factor in the Supreme Court’s decision to annul the poll. 9:30am – Voter turnout is widely reported to have been lower than expected so far. 9:20am – Police said on website they have detained someone who showed their ballot paper after marking vote and someone who took a picture of their ballot paper in the polling station set up at the Center for Holy Quran. 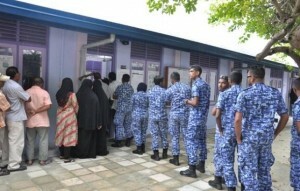 9:10am – Police queuing to vote in Addu City. 9:05am – Local news outlet CNM has reported a disagreement in Kaafy Aoll, Villingili Island, between the police and EC officials. Police were allegedly standing too close to the ballot box, less than 100 ft away, EC officials asked them to stay further away, police refused saying they were acting on orders. But after calling their seniors, police left. 8:50am – Dhiraagu and Haveeru together have introduced a service to check results via text message. Haveeru volunteers will be updating website with results throughout the day. Text “result” to 2013 and you will get total update (not the official result). To check result of a particular atoll, text letter of atoll (eg S for Addu atoll) to 2013 you will get results of that atoll. To check result of ballot box, text the EC code for ballot box to 2013 and you will get results for that box. Every SMS is charged MVR2. 8:05am – Tweets from Haa Alif Dhihdoo reveal that youth are watching over cemetery to ensure that no deceased people are able to vote in this round. 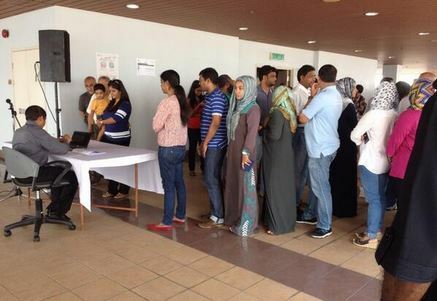 8:00am – Polling begins in Malaysia. 7:40am – Voters report that no bags or mobile phones are allowed in the queues or the polling booths. 7:35am – According to the Police, ballot papers sent to Dhaa Atoll Bandidhoo were less than the number of voters registered there. Elections Commission is now sending more ballot papers. 7:30am – Jumhooree Party candidate Gasim Ibrahim has cast his vote. 7:20am – Voting in Fuvahmulah. 7:10am – Supreme Court Guideline 13 states that the latest token number issued to voters must be announced every 30 minutes to voters [waiting in queue], the relevant official should note the token number near the person’s name on the list while marking the name of the person after he or she has voted, and impartial officials must be appointed to ensure that no person’s name is marked twice and that two token numbers are not listed near the same name. Progressive Party of Maldives (PPM) council member and prominent lawyer Mohamed ‘Wadde’ Waheed has filed a case at the Supreme Court requesting the court disqualify Dhivehi Rayyithunge Party (DRP) Leader and MP Ahmed Thasmeen Ali from parliament. Wadde yesterday told local media that Thasmeen took a MVR2.9million (US$188,067) loan from Parliament Deputy Speaker Ahmed Nazim and did not pay the money back in accordance with a Civil Court ruling. Nazim filed a case at the Civil Court in 2011 to recover MVR1.9million (US$124,513) unpaid out of the MVR2.9 Million (US$188,067) Thasmeen took from him as a loan. Wadde said that, although Thasmeen had now paid all the money, he did not pay according to the Civil Court ruling, which required the repayment of MVR320,000 (US$20,779) each month for six consecutive months to clear the debt. The Civil Court ruling came in April 2011, with Thasmeen unsuccessfully appealing the case at the High Court the same month. In June 2012, Nazim filed another case at the Civil Court because Thasmeen was not paying as per the Civil Court resulting in the court issuing a warrant freezing all the bank accounts of Thasmeen and ordering the Immigration Department to hold Thasmeen’s passport. Lawyer Wadde was chosen to contest the Kaashidhoo parliamentary by-election for the PPM in March 2012, before the party decided to support now-MDP MP Abdulla Jabir – then a member of the Jumhooree Party – prompting public criticism from Wadde. The lawyer was also at odds with his party’s senior leadership last month after filing a case in the Supreme Court challenging opposition MDP candidate and former President Mohamed Nasheed’s candidacy. In October Wadde also submitted a case to the Supreme Court seeking a ruling against the motion passed by parliament to appoint Speaker Abdulla Shahid as interim head of state in the instance that an elected president cannot be installed by the constitutionally mandated date, November 11. The same day, Wadde also submitted another case to the court asking it to rule that the MDP MP Ahmed Hamza’s appointment to the judicial watchdog – the Judicial Services Commission (JSC) – was conducted in breach of the constitution. Last night, the MDP issued a statement condemning the filing of the case against Thasmeen, alleging that the PPM was trying to undermine the constitution through the Supreme Court. The party called upon the PPM to stop all of its works against the spirit of democracy. The MDP said the PPM was using the Supreme Court to defeat political opponents because is understood that it had been defeated in the political field. The Supreme Court ruled on October 24 that both MDP MP Ali Azim DRP MP Mohamed Nashiz be stripped of their parliamentary seats over decreed debt. The ruling was subsequently rejected by the Parliamentary Privileges Committee, with scuffles ensuing between the military and MPs at the subsequent Majlis session. The current MDP and DRP alignment constitutes a simple majority in parliament. The party also said that the citizens would not allow the PPM to use courts under the influence of former President Maumoon Abdul Gayoom to deprive the MDP of its majority in parliament. Minister of State at the Foreign and Commonwealth Office (FCO) Hugo Swire has expressed concern that the Maldives international reputation and its economy could be damaged, in spite of the efforts of the country’s elections commission. Members of the UK Parliament again called for a House of Commons debate on the current situation in the Maldives last week, with Conservative member John Glen taking aim at the administration of President Dr Mohamed Waheed. “Last Saturday, presidential elections were once again postponed in the Maldives when President Waheed and his puppet interim Government of the previous elected President refused to step aside,” asked Salisbury MP Glen. Responding to the last week’s request, Deputy Leader of the House Tom Brake agreed that it was important for candidates to engage in a process that would ensure fair elections and a smooth transition of power. “It is important that elections take place to a timing specified by the Maldives elections commission and in accordance with the Maldives constitution,” said Brake. The third attempt to complete the presidential election has been scheduled for November 9, with the date for a potential second round on the 16. The constitutionally designated presidential term is set to expire on the 11th – a motion detailing transitional arrangements for the Majlis speaker to take the interim presidency were passed today (October 27). Brake referred to the prior statement made by the UK’s Foreign Secretary William Hague who announced that he was “deeply dismayed” by the cancellation of the October 19 poll. The Deputy Leader also pointed out that members would have the opportunity to question the Foreign Minister further during question time on Tuesday (October 29). The secretary of state acknowledged that there was doubt as to whether the electoral process would be resumed. “We are concerned that further delays could result in damage to Maldives international reputation and economy, despite the best efforts of the Maldives Elections Commission to get the process back on track,” said Swire. “It is important that the Elections Commission, as an independent body, are given the space needed to make preparations for elections,” he continued, adding that he would be keeping a close eye on developments. An early day motion introduced in the House of Commons earlier this month requested MPs to support calls for a free and “credible” vote, as well as condemning attempts to bar Maldivian Democratic Party candidate Mohamed Nasheed from competing in future elections. A case filed in the Supreme Court to bar Nasheed’s candidacy has yet to be withdrawn, despite criticism from both sides of the political divide. The United Kingdom remains one of the Maldives tourism industry’s biggest markets, although recent arrival figures show negative growth of a fall of -6.4% in UK arrivals this year when compared with 2012. The FCO updated its travel advisory for the Maldives after growing unrest following the delaying of polls. The guidance urged visitors to keep away from demonstrations: “There is no indication at present that any political unrest will affect tourist resorts or airports, but if you have any concerns you should check with your hotel or tour operator,” the statement read. British business tycoon Sir Richard Branson has called for free elections “as soon as possible” in the Maldives, after police blocked the election from taking place on October 19. “But before I had chance to publish it, the Maldives police intervened and stopped the ballot boxes reaching the polling stations,” Branson said. His comments follow findings from the Human Rights Commission of the Maldives (HRCM) that the police stopped the election illegally, in violation of the constitution. Additionally, a leaked Human Rights Commission (HRCM) report obtained by Minivan News questions the credibility of the evidence used by the Supreme Court to annul the first round of presidential polls, and the court’s authority to issue guidelines effectively permitting candidates to effectively veto future elections. “Knowing President Waheed as I do, my instinct is that he is not behind the blocking of the election process, and that other people who didn’t do well in the first round of the elections are trying to stop a fair election taking place,” the tycoon suggested. Waheed, who received 5.13 percent of the vote in the annulled first round, has withdrawn from the revote and publicly stated that he has no intention of remaining in power after the end of the presidential term on November 11. “I am not comfortable to stay on. It would be my preference that there be an elected President. And it would also be my preference that if this is not possible, then there would be some other arrangement made,” Waheed told The Hindu. “Plus, if a run off is needed it will be on November 16th, which is after the expiry of the current presidential term, creating a constitutional void. This whole process is a huge threat to democracy, which perhaps sadly is what some of the candidates want, having seen how the public voted in the first election round,” Branson wrote. “The people of the Maldives need fair representation and they need free elections as soon as possible. Should that not happen, governments must lobby for change and the world community must demand action until free, fair elections take place,” he concluded. Branson first waded into Maldivian politics on his blog on February 24 2012, soon after Waheed’s controversial ascension to power amid a police mutiny earlier that month. Branson publicly called for President Waheed to “do the right thing” and hold free and fair elections before the end of the year. Days later, Branson wrote another entry, saying that he had spoken on the phone to Dr Waheed, who told him he had appointed “a respected person” to examine the truth of what caused President Nasheed to “resign”. A few days later, Branson wrote a third post, resuming his first call for early elections “as soon as feasibly possible”.